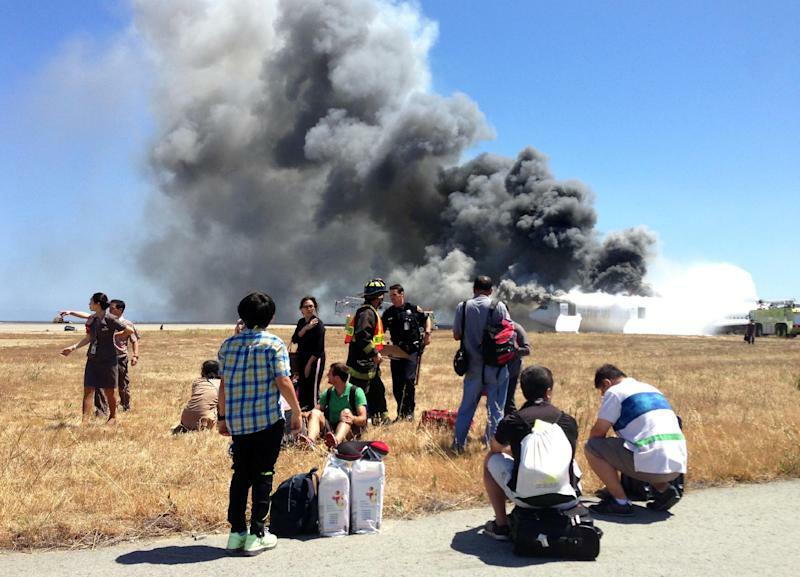 WASHINGTON (Reuters) - In the crucial minutes before an Asiana Airlines flight crashed in San Francisco last summer, the pilots voiced concern about the plane's low speed but did nothing to correct it until just before it hit the ground. A hearing on Wednesday into the July 6 crash that killed three people and injured more than 180, highlighted the pilots' mistaken reliance on the autopilot to maintain their airspeed but also Korean cultural factors that may have played a role and the design of the flight controls. The pilot flying the plane was "stressed" about hand-flying the plane, according to interviews with National Transportation Safety Board investigators, and hesitant about aborting the landing because he felt the more senior pilot observing him should make that call. Asiana Airlines Inc Flight 214 came in too slowly and too low, causing the plane's tail to hit a seawall short of the runway. The plane spun 330 degrees as it broke apart and caught fire, strewing wreckage along the runway. It was the first fatal commercial airplane accident in the United States since February of 2009 and the first fatal accident for Boeing Co's 777 airliner since it entered service in 1995. There was no indication of mechanical problems with the plane. 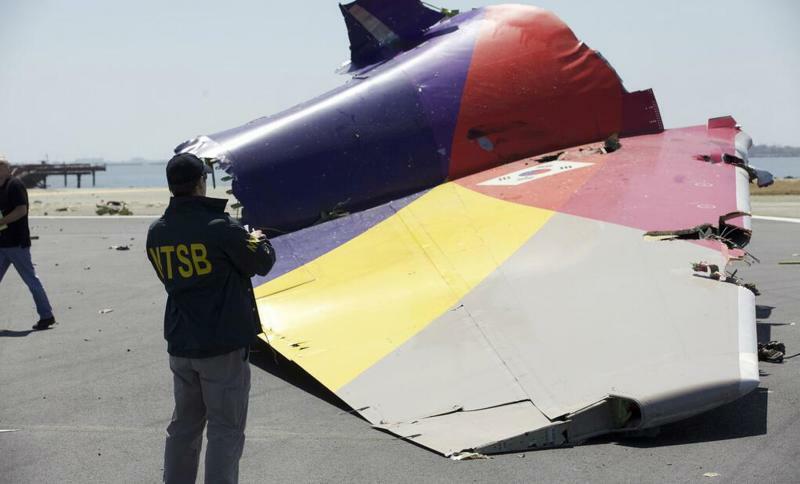 The crash has sharpened a debate on whether over-reliance on autopilot systems in modern aircraft has led to degraded human flying skills and increased the risk of accidents. There is "an issue in aviation" with cockpit automation, NTSB Chairman Deborah Hersman told reporters covering the board's hearing but she added that the airline industry has a robust safety record. Hersman said the agency has no immediate plans to make recommendations from the hearing, but if it finds a safety issue, it can make recommendations at any time. The NTSB typically takes 12 to 18 months to complete a major investigation. The hearing also questioned the pilots' training and the rescue response. One of the victims died from being struck by a rescue truck after the crash. Training has been central to the investigation because although the pilots had many hours of flying experience, Lee Kang-kook, the pilot flying the plane, was making his first landing of a Boeing 777 jet in San Francisco. His supervisor, Lee Jeong-min, was making his first flight as a trainer. The Asiana pilots said in interviews with the NTSB that they left their "flight director" system, which includes the autopilot, partly on. But in that mode, the system would not "wake-up" from hold mode, testified Captain John Cashman, a retired Boeing 777 test pilot, at the hearing on Wednesday. The lack of wake-up meant the autothrottle was not going to prevent the plane's speed from slipping below the minimum needed to keep it aloft. The design is consistent with Boeing's philosophy of leaving the pilot in charge of the controls. "We try not to put in design elements that override the pilot," Cashman said at the hearing. "We try to let him be the decider." Cashman said the design principles had been consistent for 31 years, across Boeing's 747, 757, 767, 777 and 787 models. The pilot flying the plane, Lee Kang-kook, told investigators he was worried about his ability to perform a "visual approach" to the airport, which is known for having a challenging landing. He had only performed a manual landing at that airport once before, on a Boeing 747, according to the NTSB. On July 6, he was instructed to do a manual landing because a "glide slope" system at the airport was out of service. As the plane neared the runway, a number of warnings in the cockpit indicated that the speed was dropping dangerously, according to the NTSB documents. In interviews with the NTSB, the pilots said they thought the autothrottle would correct the speed. The training pilot, Lee Jeong-min, and a third pilot, Bong Dongwon, who was in a jump seat in the cockpit, spoke about the plane's speed and "sink rate," or descent, about a minute before the plane hit the ground, according to a transcript of the cockpit voice recorder released on Wednesday. "Sink rate, sir," Bong said, about a minute before impact. "Sink rate, sir," he repeated. "Minimums, minimums," said an electronic voice about 20 seconds later. "Speed," the instructor pilot said about six seconds before impact. "Speed." The pilot later told NTSB investigators he did not feel he had the authority to abort the landing and perform a "go around." Asked whether he could have done that maneuver, he said, "that's very hard" in Korean culture because people at "one step higher level" had to make the decision to go-around. Much of the hearing addressed the use of automated systems on aircraft, which are widely credited for the safety of modern air travel because they can minimize mistakes. But they can also confuse pilots, experts said on Wednesday, particularly when pilots don't understand what "mode" the automation is in. "Problems have been observed on a large number of cockpits and for pilots at different level of experience," said Nadine Sarter, a professor at the University of Michigan and an expert on flight control automation. Bob Myers, chief of flight deck engineering for Boeing, said that if pilots are concerned about how their plane is flying under automation, the Boeing 777 system allows them to quickly exit that system and fly the plane manually. The Asiana pilots said they thought the autothrottle would "wake up" and prevent the speed from falling dangerously low. That confusion also arose in 2011 during certification of Boeing's 787 Dreamliner, which has a similar autothrottle system, documents released on Wednesday showed. In an interview following the Asiana accident, Eugene Arnold, a test pilot for the Federal Aviation Administration, said he was surprised when the 787 autothrottle did not "wake up" while set in certain "modes" but did wake up in other settings. According to NTSB documents, he thought "it was a less-than-desirable feature and it could be improved upon." Boeing did not change the system, saying the autothrottle had been certified and had no problems in service. The European Aviation Safety Agency (EASA) called the two modes with no wake up feature an "inconsistency" and suggested changing the system to avoid confusing pilots, EASA wrote in a report to the FAA before it certified the jet in 2011, cited by Arnold. "Inconsistency in automation behavior has been in the past a strong contributor to aviation accidents," EASA said. Boeing says in the 787 operating manual that in certain flight modes, the autothrottle "will not wake up even during large deviations from target speed and does not support stall protection." The matter is also noted in the 777 operation manual, but in more abbreviated form.